A form of *sexual reproduction observed in green algae of the class Zygnemaphyceae, certain fungi (e.g. Rhizopus), and various bacteria. 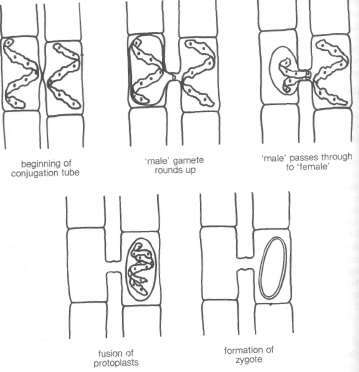 Isogametes fuse by forming a bridgelike outgrowth from one organism to the other, through which the contents of one cell migrate to fuse with the contents of the other, so forming a zygote (see diagram).